American’s are in debt and the amount of debt we owe is on the rise. According to the Federal Reserve, Americans owed just over $1 trillion on credit cards in the beginning of 2017, and according to The Nilson Report, there were 157 million Americans with outstanding debt on one or more credit cards at year-end 2016. Simply put, we have a problem with credit card debt and that problem doesn’t appear to be going away soon. Here is a look at some of the reasons why so many Americans are having a difficult time getting out of credit card debt. Swiping a card for any transaction is painless, especially considering the alternative. How often do you pay for an item at check stand, or your dinner at a restaurant with a wad of cash? Americans have become accustomed to the ease of using a card and are often without the cash on hand to pay for goods and services. After getting used to using a card for nearly everything, it can be a pretty vulnerable feeling to start paying for items with cash and see just how quickly your dollars disappear. When you swipe a credit card it allows you to live in the moment without really feeling the repercussions of your spending until the next billing statement. Even then, it is difficult to feel the real cost of a transaction when you only pay the minimum amount due on your card each month. Find out if paying the minimum on your credit card makes financial sense with our credit card minimum monthly payment calculator. Because a lack of payment doesn’t mean losing an asset, like a home or automobile, it allows the user to feel less stress when using the credit since they know a lack in payment doesn’t mean something is taken away. This makes using credit cards easier and less stressful then not paying on a secured loan (such as a mortgage or car payment). Have you ever tried to make a smaller or “minimum payment” on your home or vehicle? The terms of secured loans are very different than those that are unsecured, and that makes it easy to overspend on credit. That overspending adds up to more and more debt and less opportunity to save or the ability to pay-off the debt. The consumer can loan the money from the credit card company with a predetermined spending limit which renews as the debt is paid off. This credit limit allows the consumer to spend up to that amount on an as needed basis. Each month the entire loan (credit card balance) or at least minimum payment is due. A revolving credit line allows the spender to carry a balance forward for an undetermined amount of time if minimum payments are made on the loan. Nearly half off all card users, 43.3%, are considered “revolvers,” carrying an outstanding credit card debt month to month. Without an expectation to pay off the entire loan at a determined date, many people carry a credit card balance on one or multiple cards for years. The average credit card rate hovers close to 16%, but many cards have a much higher rate. This is quite high compared to the interest on secured loans such as the interest on car or home loan. Credit card interest rates are also expected to climb as the Federal Reserve increases rates. This will affect all credit card holders carrying a balance on their card(s). With such high interest rates, and a lack of discipline in purchases, consumers find themselves in a difficult financial situation. This can lead to only paying the minimum balance on their credit cards, reasoning it is the only way to ensure payment on all other debt. Without paying the total balance on a card, the interest rate compounds (adds to the balance of the debt) in the form of a finance charge, making it increasingly difficult to pay off the total amount owed. These finance charges may seem insignificant at first, but can lead to thousands of dollars of interest paid on credit card balances in just a single year. Take a look at your potential savings in transferring your credit card balance from a high interest card to a lower rate card with this credit card balance calculator. As if the high interest payments aren’t hard enough to swallow, consider the fees associated with late payments. According to creditcards.com, although a first-time late fee is capped at $27, consumers can’t expect repeated offenses to be so lenient. If they have a second late payment within a six-month period, or if their payment is more than 30 days late, they can expect a steep penalty from their credit card company. If a borrower falls within that category, they can be charged with another fee, this time up to $37, and with that a higher APR. A higher APR can occur with just one late payment and be applied to all new purchases. However, with a second late purchase in a six-month time period, the higher penalty APR can be applied to future purchases and the entire balance on the credit card. 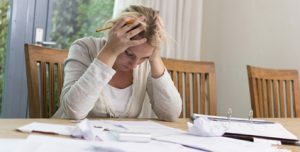 With fees being added to the minimum payment and a higher interest charge compounding to the balance of the loan, it is easy to see how millions of Americans are unable to pay off their credit card balance each month. Without financial discipline, credit card debt can be a large thorn in the side of the average consumer. Late fees and penalty APR’s just add salt to the wound of the debt-ridden average American. However, all is not lost. The debt crises has given Americans a wake-up call and millions of people are learning how to get their credit card spending and debt under control. The newest generation of adults may be leading a revolt against credit card debt. In fact, according to a survey by Sallie Mae, college students in 2015 were more likely to have debit cards (85%) than credit cards (56%). Better yet, the reasons they cited for not having a credit card were that they didn’t feel like they needed one (51%) and they wanted to avoid debt (47%). With proper education regarding the pitfalls of credit card debt, combined with an upcoming generation’s desire to avoid it, Americans can turn this massive ship around. We can develop personal financial plans with short and long term debt payoff plans, and a monthly workable budget that requires disciplined spending.